Fire at Centara Grand At Centralworld, Bangkok. Video Fire at Centara Hotel/Central World Bangkok. Hotel and shopping building has gone up in flames in Bangkok, Thailand. April, 10. 2019. Incendio en el Hotel Centara Grand At Centralworld, en el centro financiero y comercial de bangkok. Tres personas se han arrojado desde las ventanas al no encontrar salida a causa del incendio. El incendio se produjó en la planta 8 del parking pegado a las oficinas del propio hotel y se propago rapidamente por las estancias de los huespedes. El hotel y centro comercial, donde se encuentra ubicado, fue evacuado por las autoridades. 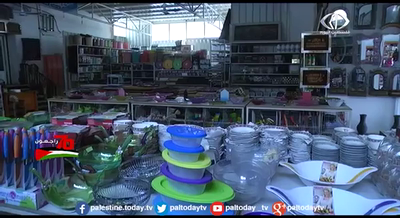 Clientes y trabajadores abandonaron el lugar. El fuerte tráfico del centro de la capital dificultó la llegada de efectivos y ambulancias. 10 de abril de 2019. 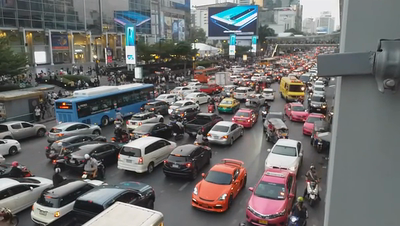 Last Day Thai Elections 2019. Democracy Party Meeting. 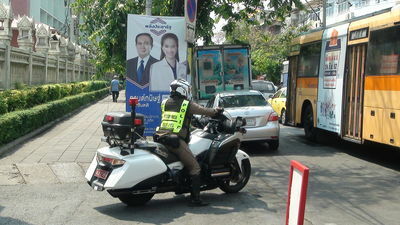 First free elections in Thailand after the Coup d’État in 2014. 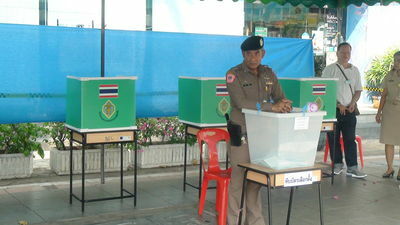 General elections are scheduled in Thailand on Sunday, 24 March 2019. The military government in 2014 promised to hold elections in 2015 but later postponed them. Prime Minister Prayut Chan-o-cha told the United Nation's General Assembly in September 2016 that elections would be held by late 2017. Then, during a 2017 visit to the White House, Prayut promised elections in 2018. In October 2017, he promised elections for November 2018. However, in January 2018, the enforcement of a bill governing the election of MPs was postponed by the National Legislative Assembly for 90 days, which delays elections until February–March 2019. The bill is one of four needed to hold a general election. The constitution mandates that elections be held within 150 days after all necessary electoral laws take effect. Delayed enforcement of any of the laws pushes back the election. Prayut Chan-o-cha. 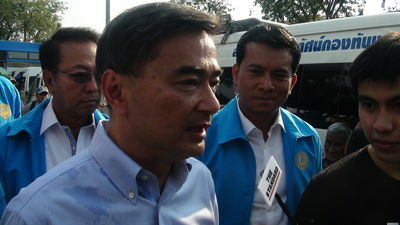 Party: Palang Pracharat. New Party. Actual PM. 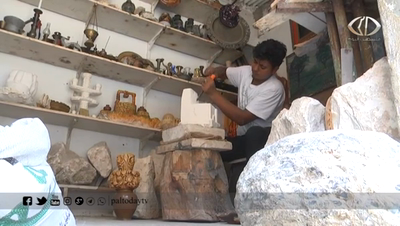 Sudarat Keyuraphan. Party: Pheu Thai. 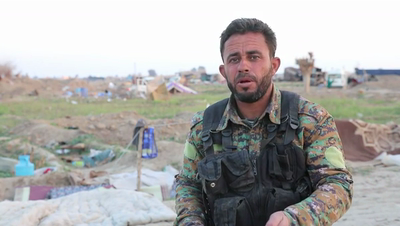 Democratic Syrian Forces at the front line fighting against ISIS, just a few meters separate the forces from ISIS camp where the families are waiting for their destinies. 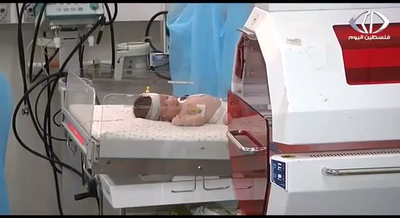 The fighting will continue till ISIS gives up. DSF clarifies that the next few days will be the right time to announce the ending of ISIS period. 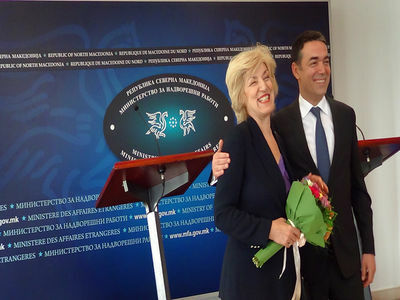 Minister of Foreign Affairs of North Macedonia Nikola Dimitrov greets Alternative Foreign Minister of Greece Sia Anagnostopoulou during her official visit in Skopje. Dimitrov and Anagnostopoulou sign an agreement on new border crossing between two countries on March 8, 2019. North Macedonia Minister for Foreign Affairs Nikola Dimitrov meets Alternate Foreign Minister of Greece Sia Anagnostopoulou in Skopje. Jazell Barbie Royale of USA walks on stage during the swimwear round. Isabella Maquilon of Ecuador poses for the camera after getting her makeup done. Nann Way Hnin from Myanmar gets her hair done as she prepares for the final round of Miss International Queen 2019, an annual transgender beauty pageant celebrated in Pattaya on March 8, 2019. Trixie Maristela, from the Philippines, does her makeup backstage. Trixie was crowned Miss International Queen in 2015. 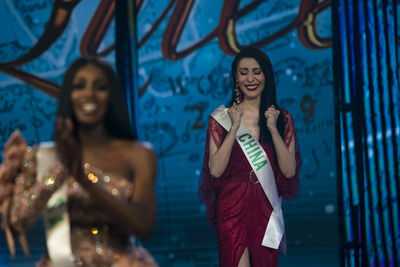 Yaya (L) from China reacts after finalizing in the third position during Miss International 2019. 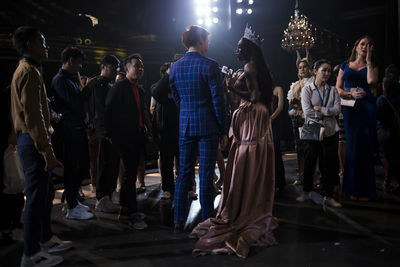 In the background, the two other finalists, Jazell Barbie Royale from US (C) and Thailand's contestant Kanwara Kaewjin (R) wait for their result. Yaya from China puts her lipstick on as she prepares for the final round of Miss International Queen 2019, an annual transgender beauty pageant celebrated in Pattaya on March 8, 2019. Contestants walk on stage during the swimwear round. Contestants wait backstage before joining the swimwear round for Miss International Queen 2019, an annual transgender beauty pageant celebrated in Pattaya on March 8, 2019. 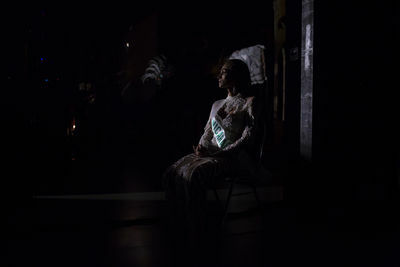 Contestants wait for their turn backstage during the final round of Miss International Queen 2019, an annual transgender beauty pageant celebrated in Pattaya on March 8, 2019. 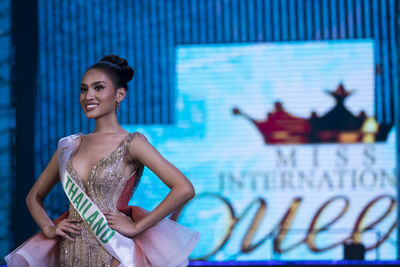 Contestants run to get dressed for the next round of Miss International Queen 2019, an annual transgender beauty pageant celebrated in Pattaya on March 8, 2019. 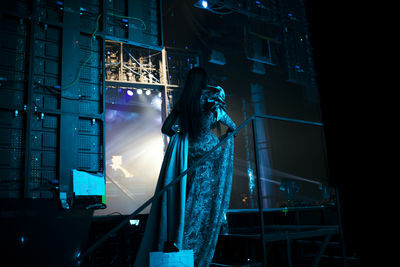 Family, friends and contestant's staff follow on TV backstage the final round of the Miss International Queen 2019. Yaya from China during the national costume round. 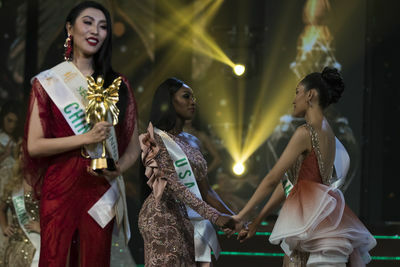 Jazell Barbie Royale from US crowned Miss International Queen 2019, an annual transgender beauty pageant celebrated in Pattaya on March 8, 2019. 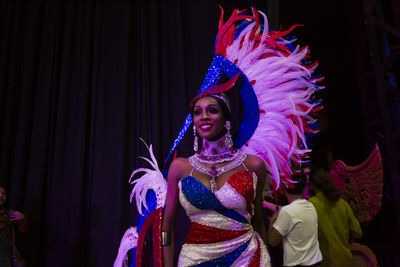 Tiffany Coleman from Nicaragua reacts after winning the national costume round. Isabella Maquilon of Ecuador takes a selfie backstage. Contestants use social media to share their experience with their family and friends. Indah Cheryl from Indonesia backstage. Jazell Barbie Royale of USA gives interviews to the press after winning the crown of Miss International Queen 2019. Kanwara Kaewjin from Thailand was one of the finalists. Isabella Maquilon of Ecuador gets ready backstage before jumping into the final round of Miss International Queen 2019, an annual transgender beauty pageant celebrated in Pattaya on March 8, 2019. 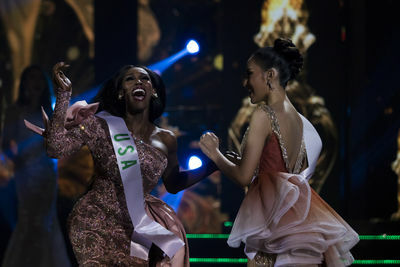 Yaya (R) from China reacts after joining the two other finalists, Jazell Barbie Royale from US (L) and Thailand' contestant Kanwara Kaewjin. 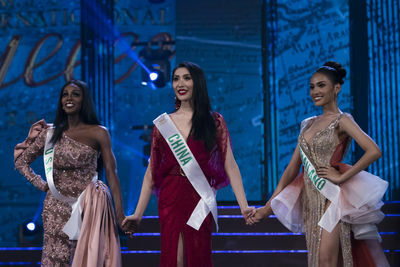 The three finalists, Jazell Barbie Royale from US (L), Yaya (C) from China and Thailand's contestant Kanwara Kaewjin (R), wait to know who will be crowned as Miss International Queen 2018. Jazell Barbie Royale from US reacts after winning the crown of Miss International Queen 2019. Yaya from China and Thailand's Kanwara Kaewjin, finished in third and second position, respectively. 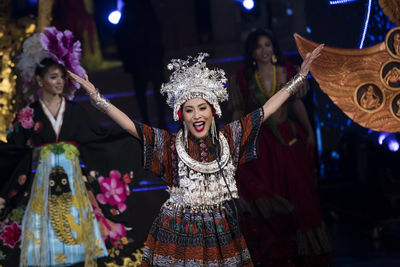 Jazell Barbie Royale of USA walks on stage during the final round of Miss International Queen 2019, an annual transgender beauty pageant celebrated in Pattaya on March 8, 2019. Contestants wait at the stage for the Jury's verdict for Miss International Queen 2019.